Yesterday, I had my first Seminar on Bordeaux at the store. It lasted for nearly 3 hours and we could have continue for another 1 or 2 hours if it wasn't time to close the store. I enjoyed it and thought that it went pretty well and the customers who attended it seems pretty pleased. I thank them very much for being here, they were a great crowd. Let's hope that it is only the beginning of long series of classes and seminars. Here is the list of the wines that we tasted, followed by a brief history and key factors on Bordeaux (I could have write much more, but it is already long enough and you can also read many other things about Bordeaux in some other previous articles and posts on my blog). Lillet is a brand of French aperitif wine based. The Lillet brothers' company (distillers and merchants of wines and spirits) was created in the town of Podensac, South of Bordeaux. 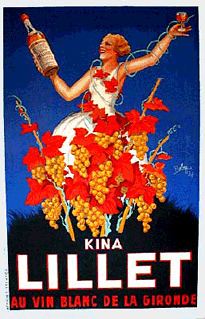 Lillet was first produced in 1887.It is a blend of 85% wine and citrus liqueurs made from a variety of oranges. Lillet is matured in oak casks and available in red and white versions. While it has been produced since the late 1800s with the same recipe, the current formulation dates from 1987 (1990 for Red Lillet) and is relatively less bitter and sugary, and more fruit flavored, than the historical one. Matthew, the owner, suggested that we start with it because people usually drink the white version, but few know or even drink the red which is also very nice. The vineyards of Chateau Ducasse are in Barsac, one of the many satellite villages clustered around the town of Sauternes and entitled to the use of its appellation. Made with 60% Semillon, Sauvignon Blanc and a little Muscadelle, this Bordeaux Blanc is more aromatic and fuller bodied than most Bordeaux whites. There is a gunflint aspect, along with mineral and citrus perfumes like Citronelle and orange blossom. On the palate too, freshness and liveliness mirror the exquisite bouquet, with a smooth, creamy way of coating the palate, enhanced by great acidity and balance. A great Semillon based white to pair with soft cheeses, goat cheese, and a variety of seafood dishes. 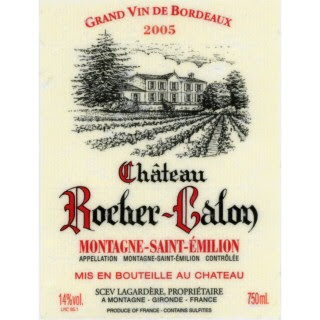 Chateau Rocher-Calon is located in Montagne Saint-Emilion, the largest satellite region surrounding Saint-Emilion. The region characterized by its production of exclusively red wines, produced from the grape varieties Merlot (75% of vines grown), Cabernet Franc (20% of vines grown) and Cabernet Sauvigon (10% of vines grown). Two other grape varieties allowed in the region, but very rarely used, are Malbec and Carménère. Chateau Rocher-Calon is an estate 12 hectares in size from which 80,000 bottles are produced with traditional winemaking methods in stainless steel vats with a long maceration of 20 to 25 days and ageing over 18 months. Michel Rolland and his team are used as consultants during the winemaking process. It will soon be two centuries now that seven generations of wine growers have been tending the vines at Château Villars. Today the estate is composed of 29.65 hectares of vineyard as well as 3 hectares of meadows and 3 hectares of forest. Since 1978, the wines of Château Villars are aged in oak barrels, one third of which are renewed every year. A full, fruity and elegant wine, the Fronsac from Chateau Haut-Villars is mostly Merlot with small amounts of Cabernet Franc and Cabernet Sauvignon. Deep aromas of cassis and redcurrants greet the nose, with notes of violet flowers and cedar. Full-bodied and round in the mouth, its big tannins and nice acidity suggest additional ageing or pairing with robust foods like braised or grilled meats. The Chateau Guionne is located in the Cotes de Bourg appellation located about 50 kms north of Bordeaux. In 1871, Chateau Giuonne's vineyards were classified as a cru. A blend of 40% Malbec, 40% Merlot and 15% Cabernet Franc, Chateau Guionne “Cuvee Renaissance” is a ripe styled Bordeaux blend with a modern twist. Full, jammy aromas of red fruit, tar and smoky notes greet the nose along with hints of cedar, vanilla, earth and spice. It is lush and elegant in the mouth, its fruit flavors wrapped by finely-grained tannins that support the dark and earthy yet generous, structured finish. Enjoy this wine on its own or paired with fine grilled or roasted meats. I can't avoid being proud of my little appellation of origin, even if I'm not too inclined to the 2003 vintage in Bordeaux. But, hey, Cotes de Bourg is where I grow up and where my grandfather used to make wines, therefore I can only be smiling at the past with nostalgia. Fiefs de Lagrange is the second wine of Chateau Lagrange, one the greatest yet low key estates of Saint Julien in the Haut Medoc region of Bordeaux. The estate which belongs to the Suntory group has kept its traditions of making juicy, fresh, earthy and food friendly Saint Julien, rather than follow the trend of the over-extracted and overly oaky style of some of the neighboring Chateaux. 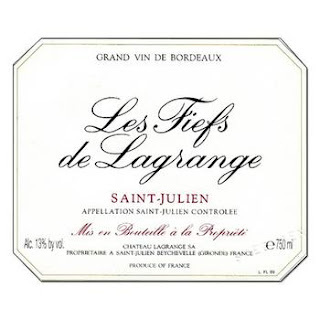 Riper and fuller than the 2000 vintage, the 2005 vintage is also a classic in Saint Julien and Bordeaux overall. It offers very good balance and harmony, delineated by great acidity and essential tannic structure, lifting and framing respectively the ripe red fruit flavors and other components. Beautiful now, it will age nicely and gain in complexity and nuances. It was the highlight of the night and remains one of my favorite wines. I have always been a huge fan of Chateau Lagrange. 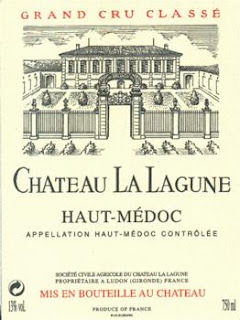 A 3rd growth located in the most southern part of the Medoc appellation, Chateau La Lagune is made by a female winemaker, which is rare, crafting elegant, balanced and expressive wines. The 2002 vintage in Bordeaux overall is surely the bargain of this last decade; somewhat restraint at first and a bit tight, most 2002s are now fully open and drink very nicely. The 2002 La lagune is no exception. A blend of 60% Cabernet Sauvignon, 30% Merlot, 5% Petit Verdot and 5% Cabernet Franc, it shows fresh, dry red fruit and a little bit of green spices. The palate is medium to full-bodied with some red fruit flavors mixed with hints of black berry, plum, tobacco, earth, cider, cinnamon and firm yet integrated tannic structure. The finish is fairly long with notes of spice. Showing superbly now! Château Les Tuileries has a small vineyard in Fargues, close to the famous Château Rieussec. The label operates under the umbrella of Château Brondelle, a century-old Graves-based house owned by the Belloc family. Full bodied and fragrant, this Sauternes is mostly Semillon with just a splash of Sauvignon. Rich honey nectar aromas rise from the glass, while on the palate, deep, rich honey flavors are joined by layers of apricot, caramel and burnt orange. Delicious! Bordeaux is located just south of the 45th parallel, roughly at the same latitude as the city of Grand Traverse (Old Mission Peninsula, MI), which is experiencing a much colder, rougher climate (yet great Gamay wines can be found among others). Compared to Grand Traverse, and many other places along the 45 parallel, Bordeaux benefits of a temperate oceanic climate, greatly imparted by the “Gulf stream”, a warm current crossing the Atlantic northeastern ward from the Caribbean to Spain, France and England, and continues along the coasts of Sweden and Norway. Therefore, the climate is fairly mild yet humid with pleasant yet rainy spring, hot summer, warm to hot fall season which is great for ripeness, and cool but not too cold rainy winter. In fact it usually rains about 200+ days a year in Bordeaux. Roughly 69 millions years ago, the Pyrenees mountain chains formed, emerging from the ocean, and the southwest of France was washed away. Gradually, rolled stones (pebbles, shells and others) from the Pyrenees, covered the sandy soils of the western shores of France from the commune Biarritz, in the French Basque country, to Le Verdon-sur-Mer, at the opening of the Gironde estuary. A distance of about 275 kms of white sandy beaches bordered by extensive forests of pine threes, representing a natural protective barrier slowing down the ocean winds and avoiding the propagation of the sand too far inland. Depending on the various books and writers, it seems that Bordeaux was established between 500 and 300 BC, by a Celtic tribes from the North called the Bituriges (riges=kings & bitu=world). They used the Gironde River and its confluents to access different parts of France, especially the Garonne River up to Toulouse, where after a short walking trip they could continue sailing on the Aude River to access the Mediterranean Sea. Boat was the fastest way at that time, and the Bituriges tolled anyone who wanted to use the river. They were roughly leaving out of that toll or “Droit de Passage”, and built the commercial and maritime foundation of Bordeaux. Shortly after, during the 1st century AC, the Romans helped develop the town, which was then called “Burdigala” and transformed it somewhat into a little Rome, a booming prosperous city. Like everywhere else in the European empire, the Romans brought to Bordeaux the need to produce and consume wine, as part of their culture and traditions. Therefore, they exported their civilization, agriculture and winemaking “Savoir Faire” to these French Atlantic shores. They planted an Albanian grape known as “Balisca”, which first thrived on the slopes of the right bank of the Dordogne River and seems ideally suited for the region that became Saint-Emilion and Libourne. Common ancestor of the Cabernet Sauvignon and Cabernet Franc, the grape was renamed “Biturica” by the Bituriges. While the Right Bank, Sauternes and the Graves gradually increased in size and reputation, the Medoc was still a vast marshland between the Gironde River and the Atlantic Ocean. A swamp with a few patches of forest mostly surrounded by flat land, with humid and poor soils, rather unproductive for the vines. Wines produced in the Graves further south instigated a certain attention, but the Medoc generated poor interest. Slowly, Bordeaux became an essential port for the commerce road between Portugal, Spain and England, Germany, Netherland, etc…Vineyard area continued to grow, as well as Bordeaux wines reputation up until the 10th -11th century. Bordeaux had a renaissance around the mid-12th century, when Henry Plantagenet, future King of England, married Duchesse Alienor d’Aquitaine, and the all southwest of France became English for 300 years (1152-1453). Bordeaux wines were some of the main and most appreciated beverage of the court of England. Apparently, even Edward II, a British King who married in London in 1307, ordered millions of bottles to satisfy all of his guests and the rest of the royal crowd. Wines from the right bank were shipping by boat all over Europe. The city flourished, primarily due to wine trade with England and a few other countries. The vineyard area continued to expand to respond to the demand and drastically increased and spread up until the mid-18th century. Bordeaux greatly evolved and experienced a golden age between the 15th and 18th century, more especially from the 17th. Although, certain of the current estates from the Medoc already existed as early the 10th century, the Medoc was still mostly a swamp, with no roads or really defined paths, only a few villages, mostly small ports, scattered enclaves along the western bank of Gironde which became Pauillac, Margaux, Saint-Julien and Saint-Estephe. 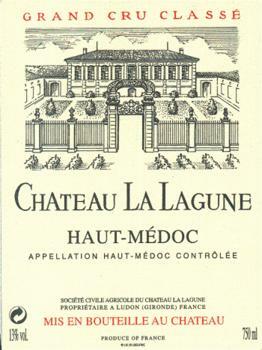 In the 17th Century, Chateau Haut-Brion and a handful of other estates of the Graves, Sauternes and Saint-Emilion area became the leading Chateaux in the Northern markets, having great success especially with the British and the Dutch, which also were among some of the most prominent Négociants (wine merchants) of Bordeaux. The Dutch engineers, hired to restore the swampy area of the southwest of France, restructured the Medoc area by digging the “Jalles”, water drainage ditches or tranches, which are still used to this day. The British, Dutch and German developed the commerce of Bordeaux wines and established Négociants, three-tier system. Chateaux and growers sell to brokers who in turn sell to Négociants, who aged, bottled and marketed all Bordeaux wines. Négociants were (and for the most part, still are) the merchants that bought, promoted and marketed, bottled and labeled most Bordeaux wines up until the 50-60s; because most Chateaux and estates didn’t necessarily have the appropriate cellars and/or storage facilities to vinify and age their wines or even the necessarily costly tools to bottle their wines. The 18th-19th centuries translated into the golden age for Bordeaux and its wines; more especially the town itself which has remained to this day a jewel of the 18th century architectural style. It also marked the renaissance of the “Quai des Chartrons” (Chartrons’ pier) where most Négociants established their headquarters for practical and economical reasons. Being a pier along the western bank of the Garonne River at the northern edge of the town of Bordeaux, “Quai des Chartrons” was obviously a direct access to the port. It consisted into an ensemble of huge warehouses, built with the famous and highly recognizable pale yellow limestone as the prominent characteristic of most building from this era in Bordeaux, where the wine was aged and barrels were stocked before bottling or being sent away. “Quai des Chartrons” was the wine import-export center of Bordeaux. “Quai des Chartrons” encompassed the “Place de Bordeaux”, a nickname for the Three-tier systems’ main actors, which consisted of the Chateaux owners, Brokers and Négociants. They were the ones behind the famous (or infamous) 1855 Bordeaux classification that was created for Napoleon III “Exposition Universelle de Paris”, based on the actual price of the wines at that time, which was somewhat indicator of the quality because of higher demand. While Courtiers (or brokers) were only selling the wines between Chateaux and wine merchants, Négociants were the businessmen wine merchants, who pretty much did whatever they wanted with the wines once in their possession. Meaning that Châteaux owners had little or none to do with the final blend and the resulting bottled and sold wines. Because it is often raining and humid in Bordeaux (climate also being influenced by the Atlantic ocean and the Gironde-Garonne-Dordogne rivers) and consequently full ripeness is difficult to reach, many Bordeaux wines usually shows high tannins with green, vegetal edges resulting in a dry, austere and tannic profile, that needed time to settle down and integrate. Techniques and technology in the last 30 years allowed to easily rectifying certain defaults and angularities, but before that Bordeaux wines needed a bit of help in certain cases. To trigger more appeal, some wines were discreetly and anonymously re-enforced with high amount of sugar (heavy chaptalization) to increase alcohol level and/or be complemented (mostly enhanced in some cases) by an addition of riper grapes or even wines from warmer regions like Languedoc-Roussillon and even Spain and Algeria, to increase fruitiness, richness and depth. Of course, people were closing their eyes on it, Châteaux owners were not necessarily aware of it and the resulting wines were almost costumed for the taste of the different regions and markets they were sold to. It was business as usual for the Bordelais. Remember that before the arrival of new methods and technology, these kinds of things (cited above) used to happen quite often due to the raining and humid climate of the region (200+ days per year in average), and consequently resulting in lack of ripeness and diluted juice. Therefore, statically talking, most Bordeaux decades, since 1900 (and probably even before), can be divided in 3 categories: 2-3 good to very good vintages; 3 OK to good vintages and 3-4 mediocre to OK vintages (per decade). It translates that Bordeaux only sells 2-3 good to very good vintages per decade on which Bordeaux Châteaux owners can make a decent amount of money and inflate the prices for higher profits (which has been especially the case in the last decade). Yet, it also means that the other vintages (good to OK and mediocre), especially the ones before the 50s, needed a bit of help to be better appreciated and consequently sold, except may be 1945, 47 and 49 which were the best vintage of the 40s. • And it is basically only when new and more adapted techniques of vinification and more careful vineyard management (and deeper concerns about applying the rules) appeared in the 80s (with a slight increase of temperature), that most of the unlawful used recipes were dropped for a more respectful use of the rules but also more natural and traditional way of making wine. • The 90s only produced a few very good vintages toward the middle and the end of the decade and saw the apparition and rapid growth of the sustainable, “Lutte Raisonnée”, Organic and Biodynamic movement, more developed on the right bank with the “Garagistes”. • 2000s were obviously one of the best decades for Bordeaux, with the 80s, but it is partly due to the fact that with the new techniques and methods and rectification processes, bad or good vintages, rainy or not, it has become more difficult to produce bad wines in Bordeaux. Also, just to remind you and despite certain preconceived beliefs, the notion and concept of “Embouteillé a la Propriété” or “au Château” (bottled at the property or at the Château), only dates from the 50s. At this time, only the elite and “crème de la crème” wineries like the first growth and a few more “privilegiés” had access to bottling machine. A bottling machine mounted on a truck was passing by in the villages and the estates, and that was pretty much it. Before that, bottles were bottled and corked one by one, by hand with a rudimentary corking machine. Quality of the final blended wine in the bottle depended mostly on the quality, care and professionalism of the local cooperatives and the Négociants to whom the wines were sold (in most cases). Moreover, wines from the same Chateau and same vintage were not always bottled at the same time, which increased the risk of defaults and diseases, but also the overall quality and difference of taste between the various batches. Even now, blending still occurs at different stages of the vinification process, sometimes before the barrel ageing and in most cases after barrel ageing, just before light resting period and bottling. Bottling is now usually conducted at the same time for all the bottles of a same vintage, over a period of a few days rather than weeks (before). • Châteaux Owners remain Châteaux owners, yet with much more control and interest than ever before regarding the quality and the taste, and the overall profile of their wines. It is partly due to the strict rules imposed by the AOC system, but it is mostly due to the facts that most Châteaux now have their own cellars, ageing facility and bottling system to always keep a controlling eye on the entire production process from the harvest to bottling and even selling. • Courtiers still do the same things and are still shared and pulled both ways between both the Châteaux owners and the Negociants. • Négociants still are the merchants of the “Place de Bordeaux”, yet they do not vinify, age or bottle the wines anymore. They basically have lost the control over the taste and the production of the wines that they sell. That said, like before, they still are stuck in the position of buying their entire allocations from the Châteaux through the Courtiers, each vintage and every year, otherwise they could lose part of their allocations which could be a great lost, money-wise, especially for the best vintages. Négociants are also more careful in their choices and which Courtiers they are pairing with. Over the years, the business relation usually becomes a trustee friendship and the Courtier-Négociants relationship usually last as long as business and personal understanding don’t clash. Négociants spend more time than ever before, counseling the Châteaux owners about the different markets and trends, tasting at the Château and traveling around the world to promote and market wines. One thing hasn’t changed in more than 200 years and more especially since the Bordeaux classification of 1855, it is still the Chateau owners who fix the price of their wines at the property. The “Place de Bordeaux” which consists of the Chateaux owners, the brokers and the Négociants finding a consensus about the final prices usually fix prices. Yet, since 2000, it seems that internal estate politic, difference of point of view, opinions and needs and greed evolved together to dictate some of the insane price increases of the last decade. Before Brokers and Négociants used to have a certain influence, now and since the classification, Châteaux owners decide their prices depending on their rank, their reputation and their habits, but more importantly, after spying on their neighbors. Yes, that is right, let’s say that if your neighbor decided to elevate his price because he estimated that his wine is worth a higher price than the previous year, because of its quality and the overall quality of the vintage (and the amount of yields); it is automatically sure that you will estimate your wine being netter than your neighbor’s wine, therefore you’ll apply a slightly equivalent or even a more (understandably) higher price than your neighbor. Nowadays, Bordeaux production consists of 88% of reds and the 12% remaining are divided with mostly whites (dry and sweet) and an increasing amount of rosé wines, which were first created to remove juice from the vat by "saignée" to increase the richness of the reds in the 70-80s and were used mostly for the family consumption. However, the useful action of removing extra juice, due to diluted must, to produce rosé (because it usually rains about 200+ days a year in Bordeaux), became a trend and rapidly a profitable new market, which exploded in the 90s and 2000s. Bordeaux now encompasses more than 12,000 so-called “Châteaux”, grape growers and wineries (including Domaines, Clos, etc…) scattered over roughly 116,000 hectares of vineyards, divided in 57 appellations, producing more than 850 million bottles a year. The controversial point is that people in general talk about Bordeaux as a whole, in general terms. But Bordeaux offers many different tastes and profiles from its 37 main appellations out of the 57 all together; yet people continue to talk about Bordeaux as one and only entity. This happens partly because Bordeaux never really promoted or marketed its wines, for the most part, they have been sitting and counting on their reputation for the last 200 years, to sell their wines. It is also due to the fact that out of the roughly 12,000 Chateaux and estates in Bordeaux, only about 1,000-1,500 are really known to most markets, the rest remain in the shadow of that small group. And from those, only about 700-800 are really selling well every year. And believe it or not, but the whole reputation of Bordeaux only lies in the hands of the best 250-300 top-tier Chateaux, which sell for a lot of money ($40-$2000). That is one of the main reasons why most people think that Bordeaux wines are expensive. Consequently, "Petits Chateaux" don't benefit of that reputation and suffer a great deal to promote their quality. There are some truly good deals between $8-$25, but it is in the mind of most people that inexpensive Bordeaux are not worth trying and buying or that they are not as good as they should be for the asking price. It is not necessarily true, but the market gives this impression and people tend to stick to what is advertised and criticized in the press, without trying to understand further or taste the wines (only a small amount of the amateurs and the connoisseurs do). Nowadays like before, Bordeaux wines are still sold by many Négociants houses and Courtiers, who take their own respective commission or marge-in above the price of each other. Châteaux owners still decide of the original prices, and then Courtiers take their margin (small %) and finally the Négociants (a slightly bigger %). Prices also evolve with the different offerings (or "tranhes") during the "En Primeur" (or Futures) campaign. Not to mention, but prices take another toll when they are delivered and imported (importer's margin then distributor's and /or retailer's margin). The last decade has brought a lot of controversies regarding price to quality ratio. The big question is what really justifies such prices? Super high quality? Reputation? The 1855 Bordeaux Classification? Or and more likely the constant soaring demand from the emerging markets? In the last ten years, the soaring demand from emerging countries like China, Japan, Brazil, Russia, Corea and a few other countries, has help most Bordeaux prices to skyrocket and continue to trigger interest. Yet, Europe demands being quite slow, and America mostly buying the best vintages and booing the lesser ones, atop a difficult market, the expensive 2005 didn't sell as well as plan. Moreover, the warehouses in France (and pretty much everywhere else) are full of unsold 2006, 2007 and 2008.... Bordeaux is eager to sell their 2009. And to catch up with their unmoving inventory and try to take advantage of this last vintage to make a bit of money based on the anticipated quality of the vintage and the excitation of the press over it...They did it again...(sigh)... they raised their price up for the 2009 vintage. Based on the prices of the best 200-300 estates, the bad image of Bordeaux, which doesn’t benefit the smaller, lesser-known estates, is mostly created by greed and unashamed lack of attention to the different markets from the “Place de Bordeaux” (Owners, Brokers & Négociants). If you listen to the Bordelais, nearly every vintage of the last decade has been a “vintage of the decade” and their wines are always the best, and greater than previous year. It also always better than their neighbors. It all started with the magnificent 2000 vintage; the ultra overripe and inharmonious 2003; then the more balance and harmonious, rich and powerful, yet tannic and unsettled 2005; and 2009 seems that it will beat all these previous vintages and their respective prices, which will once again skyrocket and trigger a lot of talk. Although apparently this year, there are no real consensus regarding the quality of a specific region compare to another, it seems that Bordeaux 2009 is a pick-and-choose vintage, mostly due to the unusual high alcoholic content and the ripeness of the fruit due to a beautiful end of the summer and harvest season. Not every wine, despite the quality of the vintage, justified the imposed 2009 prices. When are high prices justified? And why increasing the prices again? Yet, and fortunately, they are still plenty of great Petits Chateaux to be discovered that won’t kill your wallet and still provide you with a satisfying experience that will, once again, prove that it possible to find interesting Bordeaux for a decent price. Some of the 2002, 2004, 2006 and 2007 are drinking beautifully now and their price tag is definitely lower than the 2000, 2003, 2005 and the future 2009. The “En Primeur” Bordeaux 2009 tasting is now finished, done and over and soon will start the craziness of the long established, yet somewhat archaic, three-tier selling system that the “Place de Bordeaux” has used for the past 200 years (at least). And yes, I said “game”, because it is a game after all, that has been working like a well oiled machine and never really stopped since the British and the Dutch somehow instigated it few centuries ago. It involves thousands of people in Bordeaux (and in the rest of the world), who somewhat, depend on it. And despite creating, every year, many controversies, critics, disputes, anger and joy, it constitutes one of the most awaited and lucrative markets in the wine world industry. you've hit the nail on the head. The problem is something that too few men and women are speaking intelligently about.